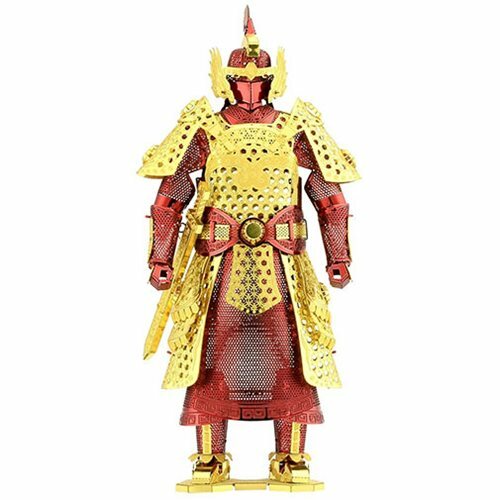 This Chinese Ming Armor Metal Earth Model Kit is an example of the Dahan General's armor from ancient China. This group of 1,500 guardians belonged to the army of the secret service of the Ming Dynasty. Their task was to protect the emperor and the dynasty. Now you can build your own ancient army with easy-to-follow instructions. Pop out the pieces, bend the tabs, and connect them at the attachment points! Includes 2 metal sheets and a moderate difficulty. After assembly, armor measures about 4 1/4-inches tall x 2-inches long.